Billed since its 2009 inception as Near East Quartet, the elevation of saxophonist Sungjae Son's name reflects the saxophonist's status as founder and de facto leader of this South Korean outfit, which forges a contemporary path from traditional roots. Its only previous album, the instrumental Chaosmos (KT Music, 2010) featured two percussionists alongside Son and co-founder, guitarist Suwuk Chong. The band's aesthetic changed significantly in 2015 with the addition of two women, pansori singer/percussionist Yulhee Kim and jazz drummer Soojin Suh. 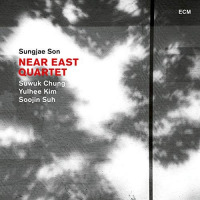 On this, the quartet's ECM debut, Son presents his vision of the meeting between Korean traditional music and improvisatory elements -between minimalism and power. Distorted electric guitar, skittering drums and melodious tenor saxophone announce the brooding instrumental "Ehwa," one of five Son-composed tunes. Guitar and saxophone alternate between lead and unison lines, but it's Suh's free-roaming polyrhythms that command the attention on this powerful though concise opener. A faint, humming drone underpins the traditional tune "Mot," where spacious, single-note guitar scales, lowing bass clarinet and tiny metallic percussive accents frame Kim's haunting balladry. Kim studied pansori with Bae Il Dong, though her performance throughout the album is titled more towards emotional nuance than shows of operatic power. Traditional Korean percussionist Sori Choi guests on the vocal ballad "Baram." Kim once again plies a plaintive course, her voice at one point ululating like the crying wind, her poise in contrast to Kim's restless animation. Choi, on gong, sounds a coarse pulse through the slow waves of baritone clarinet and guitar sustain, his shamanistic percussion rising in intensity as the music briefly swells. Greater percussive input throughout the recording would perhaps have stretched the music's dynamics to greater dramatic effect, but at the cost, you suspect, of Son's less-is-more philosophy. Beauty and melancholy infuse the ballad "Galggabuda." Here, Kim's aching delivery is offset by the gentle warmth of Son's tenor, while rustling shells and padding drums provide subtle momentum. Breathy tenor and looped guitar dovetail dreamily on "Garam"an abstract soundscape of meditative allure. Chong's doomy, fuzz-toned guitar riff lends an early Black Sabbath-esque air to "Pa:do," a traditional song whose extended instrumental finale is enlivened by the impressive Suh's industry. The sombre, almost pulseless instrumental "Ebyul" moves listlessly, dirge-like, with Son's vibratoless melody drifting over restless percussive stirrings. Kim's yearning vocals guide "Jinyang," which morphs from its melancholy folk beginningvia a sudden burst of drum fillsinto a driving, ambient-jazz universe. At under forty minutes in length there's an economy in Sungjae Son / Near East Quartet's proposal, as though these are musical sketches to be filled out on the stage. Almost any of these deftly crafted tunes could have achieved spectacular lift-off, particularly if Kim had played a more progressive role. Instead, the ever-present tensions merely simmer, and gradually fade. Perhaps it's a case of ECM sculpting the music to better fit its aesthetic, but whatever, this admittedly haunting, and occasionally provocative offering only hints at the soaring power of the quartet's live shows. As good as this recording is, there remains a nagging feeling that Near East Quartet has plenty more in reserveand that is an exciting prospect. Track Listing: Ewah; Mot; Baram; Galggabuda; Garam; Pa:do; Ebyul; Jinyang. Personnel: Sungjae Son: tenor saxophone, bass clarinet; Suwuk Chung: guitar; Yulhee Kim: vocal, percussion; Soojin Suh: drums; Sori Choi, traditional Korean percussion (3).